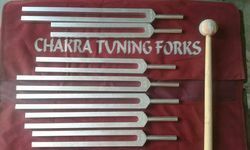 Leading Exporter of solfeggio tuning fork set of 9, tuning forks, brain tunning fork, chakra tuning fork, tuning fork - chrome plated steel and human organ tuners tuning fork from Ambala. 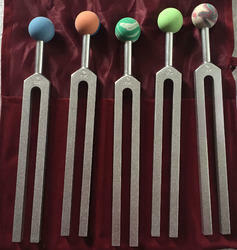 The Sacred Solfeggio Tuning Forks are a set of forks in the sacred frequencies known as the Secret Solfeggio. Deciphered by Dr. Joseph Puleo using the ancient Pythagorean method of reducing the verse numbers to their single digit integers, the codes revealed a series 6 of electro-magnetic sound frequencies that correspond to the 6 missing tones of the ancient Solfeggio scale. These original sound frequencies were used in Ancient Gregorian Chants. The chants and their special tones were believed to impart tremendous spiritual blessings when sung in harmony during religious masses. These frequencies can now be produced with the Sacred Solfeggio Tuning Forks. 174 Hz, 285 Hz, 396 Hz, 417 Hz, 528 Hz, 639 Hz, 741 Hz, 852 Hz, 963 Hz High-quality aluminum forks are made in the USA. Each set includes a velvet pouch for safe-keeping.
. for detail of tunning forks we make kindly contact us . It may be normal or weighted tunning forks. may be with ball or without ball. We offer all types of tunning fork and pipes used for medcial purpose, lots of diseases can be cured through this technique, for detail of tunning forks we make kindly contact us . Whole Body - 2 Healing Tuned Pipes , Sacred Solfeggio - 9 Healing Tuned Pipes , Harmonic - 8 Healing Tuned Pipes , Om 136.10 Hz Healing Tuned Pipe , Om - Tuning Forks , Whole Body Tuner - Tuning Forks , Brain set - Tuning Forks , Harmonic Spectrum - Tuning Forks , Om Weighted - Tuning Forks , 528Hz - Tuning Forks DNA repair or god frequency, chakra tunning fork. 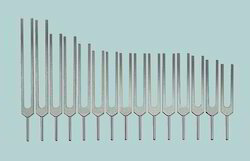 We offer all types of tuning fork. used in medical treatment of various ailments. aluminium made, with or without weights. 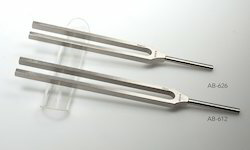 We offer all types of tuning forks. 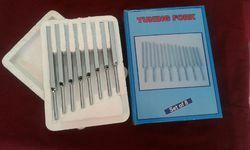 displayed is chrome plated steel tunning fork set of 8 in case. Human Organ Tuners are a set of 15 Tuning forks. They represent the 15 main parts or organs of the physical human body. An organ is a tissue that performs a specific function or group of functions. Usually there is a main tissue and sporadic tissues. The main tissue is the one that is unique for the specific organ.Theses tuning forks are tuned to the frequencies of healthy human tissue. .
Mars 289.44 Hz, Jupiter 367.16 Hz , Saturn 295.7 Hz ,Neptune 422.88 Hz ,Uranus 414.72 Hz ,Pluto 280.5 Hz.